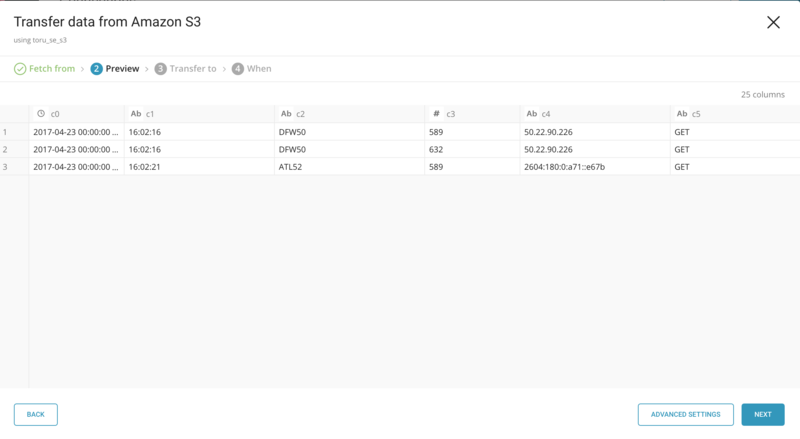 The Data Connector for Amazon S3 enables you to import the data from your JSON, TSV, and CSV files stored in an S3 bucket. You can use TD console to create your data connector. When you configure a data connection, you provide authentication to access the integration. In Treasure Data, you configure the authentication and then specify the source information. Go to Catalog and search and select AWS S3. Click Create. You need a client ID and access keys to authenticate using credentials. Register your credential. Set the following parameters. basic: uses access_key_id and secret_access_key to authenticate. See here. anonymous: uses anonymous access. This auth method can access only public files. session: uses temporary-generated access_key_id, secret_access_key and session_token. Click Continue. Name your new AWS S3 connection. Click Done. Next, you need to create “New Transfer” on My Connections page. You can prepare an adhoc DataConnector job or a scheduled data connector job. In this section, the following 4 steps are required. You need to register the information that you would like to ingest. Incremental: enables incremental loading. If incremental loading is enabled, config diff for the next execution will include last_path parameter so that next execution skips files before the path. Otherwise, last_path will not be included. You can limit the access to your S3 bucket/IAM user by using a list of static IPs. Contact support@treasuredata.com if you need it. If you would like to set specified column name, choose “Advanced Settings” button. Advanced Settings allow you to edit guessed properties. Edit the following section, if you need to. Default timezone: changes Time zone of timestamp columns if the value itself doesn’t include time zone. Name: changes a name of the column. Column name is supported consisting of lowercase alphabets, numbers, and “_” only. Type: parses a value as a specified type. And then, it stores after converting to TreasureData schema. In this phase, select your target database/table you want to import to. Partition key Seed: choose the long or timestamp column as the partitioning time. As default time column, it’s used upload_time with using add_time filter. In this phase, you can set an adhoc or schedule configuration for your job. Once now: set one time job. Schedule: accepts these three options: @hourly, @daily and @monthly and custom cron. Delay Transfer: add a delay of execution time. TimeZone: supports extended timezone formats like ‘Asia/Tokyo’. Finally, your DataConnector jobs are listed up on My Input Transfer. In this page, you can edit your existing job. Also, you can see a DataConnector job’s detail, which run before, by clicking Last Transfer section. You can schedule periodic data connector execution for incremental S3 file import. We take great care in distributing and operating our scheduler in order to achieve high availability. By using this feature, you no longer need a cron daemon on your local datacenter. 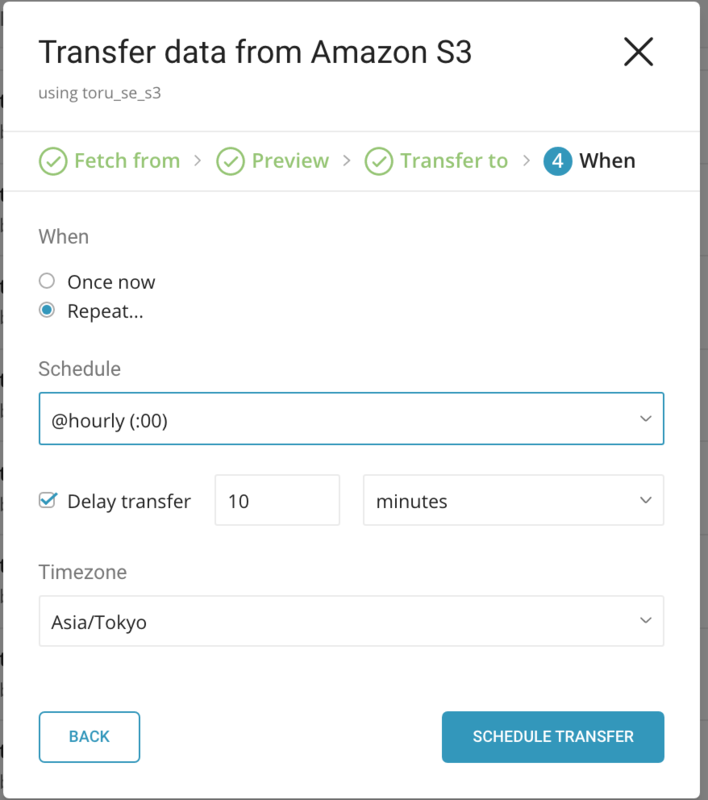 For the scheduled import, the Data Connector for Amazon S3 imports all files that match with the specified prefix (e.g. path_prefix: path/to/sample_ –> path/to/sample_201501.csv.gz, path/to/sample_201502.csv.gz, …, path/to/sample_201505.csv.gz) initially and remembers the last path (path/to/sample_201505.csv.gz) for the next execution. A new schedule can be created using the td connector:create command. The following are required: the name of the schedule, the cron-style schedule, the database and table where their data will be stored, and the Data Connector configuration file. The `cron` parameter also accepts three special options: `@hourly`, `@daily` and `@monthly`. By default, schedule is setup in UTC timezone. You can set the schedule in a timezone using -t or --timezone option. Note that `--timezone` option supports only extended timezone formats like 'Asia/Tokyo', 'America/Los_Angeles' etc. Timezone abbreviations like PST, CST are *not* supported and may lead to unexpected schedules. You can see the list of currently scheduled entries by running the command td connector:list. td connector:show shows the execution setting of a schedule entry. td connector:history shows the execution history of a schedule entry. To investigate the results of each individual run, use td job <jobid>. td connector:delete will remove the schedule. Q: Data Connector for S3 job is running for a long time, what can I do? Narrow path_prefix option and reduce the count of S3 files. Set 268,435,456 (256MB) to min_task_size option. Q: How do I troubleshoot data import problems? Review the job log. Warning and errors provide information about the success of your import. For example, you can identify the source file names associated with import errors. Before setting up the connector, install the ‘td’ command. Install the most current Treasure Data Toolbelt. First, prepare the seed.yml as shown in the following example, with your AWS access key and secret access key. You must also specify bucket name, and source file name (or prefix for multiple files). For more details on available out modes, see Appendix. Second, use connector:guess. This command automatically reads the source files, and assesses (uses logic to guess) the file format and its field/columns. If you open up load.yml, you’ll see the assessed file format definitions including file formats, encodings, column names, and types. Then, you can see a preview of the data using the td connector:preview command. the guess command needs more than 3 rows and 2 columns in source data file, because the command assesses the column definition using sample rows from source data. If the system detects your column name or column type unexpectedly, modify load.yml directly and preview again. Currently, the Data Connector supports parsing of “boolean”, “long”, “double”, “string”, and “timestamp” types. The `preview` command will download one file from the specified bucket and display the results from that file. This may cause a difference in results from the preview and issue commands. Finally, submit the load job. It may take a couple of hours depending on the size of the data. Specify the Treasure Data database and table where the data should be stored. 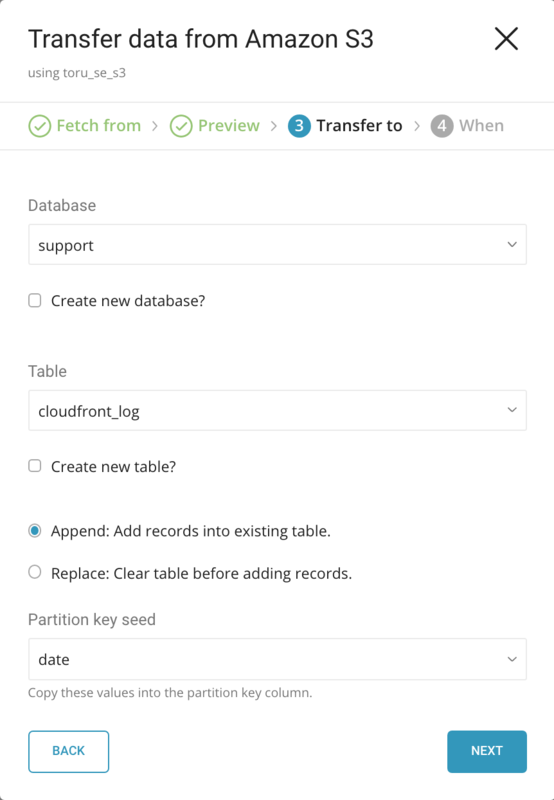 It’s also recommended to specify --time-column option, because Treasure Data’s storage is partitioned by time (see data partitioning) If the option is not provided, the data connector will choose the first long or timestamp column as the partitioning time. The type of the column specified by --time-column must be either of long and timestamp type. At present, the data connector does not sort records on server-side. To use time-based partitioning effectively, sort records in files beforehand. If you have a field called time, you don’t have to specify the --time-column option. You can specify file import mode in out section of seed.yml. This is the default mode and records are appended to the target table. This mode replaces data in the target table. Any manual schema changes made to the target table remain intact with this mode. The IAM credentials specified in the YML configuration file and used for the connector:guess and connector:issue commands need to be allowed permissions for the AWS S3 resources that they need to access. If the IAM user does not possess these permissions, configure the user with one of the predefined Policy Definitions or create a new Policy Definition in JSON format. Replace your-bucket with the actual name of your bucket. In certain cases, IAM basic authentication through access_key_id and secret_access_key might be too risky (although the secret_access_key is never clearly shown when a job is executed or after a session is created). 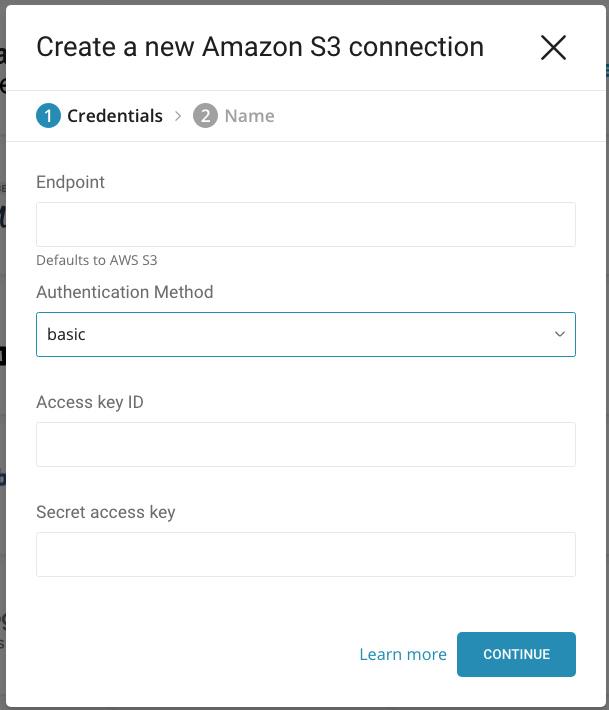 The S3 data connector can use AWS Secure Token Service (STS) provided Temporary Security Credentials. Using AWS STS, any IAM user can use his own access_key_id and secret_access_key to create a set of temporary new_access_key_id, new_secret_access_key, and session_token keys with an associated expiration time, after which the credentials become invalid. The simplest Security Credentials with an associated expiration time. The temporary credentials give access to all resources the original IAM credentials used to generate them had. These credentials are valid as long as they are not expired and the permissions of the original IAM credentials don’t change. Adds an extra layer of permission control over the Session Token above. When generating a Federation Token, the IAM user is required to specify a Permission Policy definition. The scope can be used to further narrow down which of the resources, accessible to the IAM user, the bearer of the Federation Token should get access to. Any Permission Policy definition can be used but the scope of the permission is limited to only all or a subset of the permissions the IAM user used to generate the token had. As for the Session Token, the Federation Token credentials are valid as long as they are not expired and the permissions associated to the original IAM credentials don’t change. AWS STS Temporary Security Credentials can be generated using the AWS CLI or the AWS SDK in the language of your choice. where: * temp_cred is the name of the Federated token/user * bucketname is the name of the bucket to give access to. 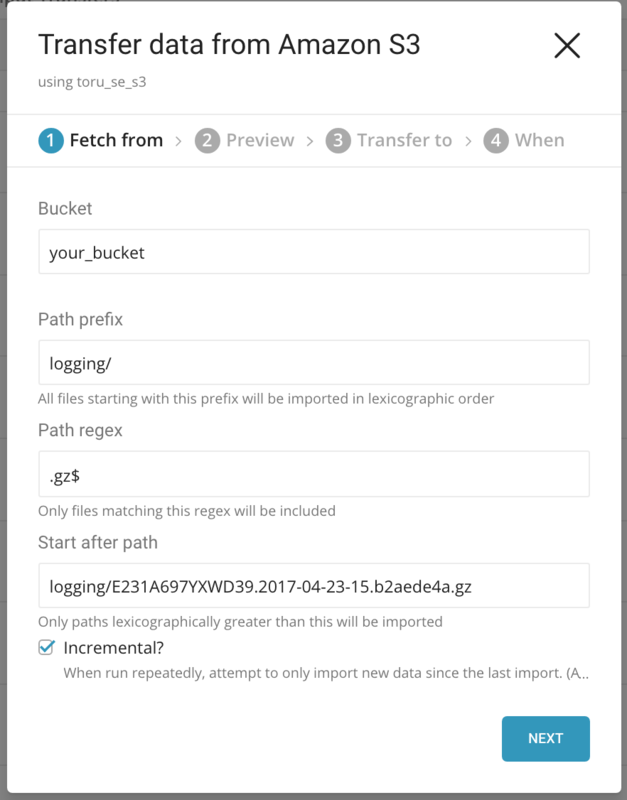 Refer to the ARN specification for more details * s3:GetObject and s3:ListBucket are the basic read operation for a AWS S3 bucket. AWS STS credentials cannot be revoked. They will remain effective until expired, or until you delete or remove the permissions of the original IAM user used to generate the credentials. When your Temporary Security Credentials are generated, copy the SecretAccessKey, AccessKeyId, and SessionToken in your seed.yml file as follows. and execute the Data Connector for S3 as usual. Because STS credentials expire after the specified amount of time, Data Connector job using them may eventually start failing when expiration occurs. Currently, if the STS credentials are reported expired, the Data Connector job will retry up to the maximum number of times (5) and eventually complete with 'error' status.